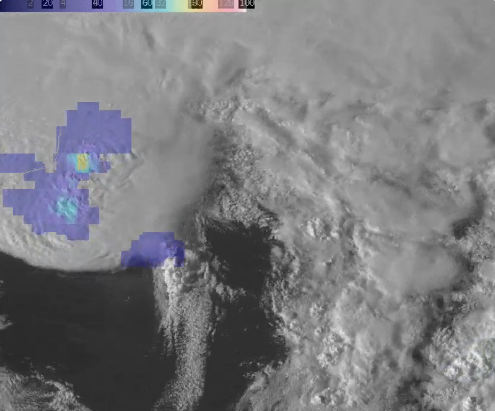 How GOES-16 Transformed the Way We Studied the Latest April 2019 Nor'easter! DISCUSSION: There is no question that as atmospheric and climate science entered the 21st century, atmospheric observations took on a whole new meaning with a state-of-the-art approach to how and why things are done. One such example to prove this point is regarding the extent to which the GOES-16 satellite imager blew away the atmospheric and climate science community in terms of its unique ability to observe the most recent powerful coastal storm which caught the attention of the Mid-Atlantic and Northeast coastal regions. A perfect example of how the GOES-16 satellite imager stunned the entire meteorological world was in the context of this satellite’s ability to view the lightning occurring in association with this most recent coastal storm which rapidly intensified just offshore from the North Carolina coastline. More specifically, as GOES-16 watched the system developed both in the vicinity of the coastline and then just offshore from the North Carolina coastline, there was substantial lightning coverage which expanded within and near the center of the system’s core circulation as well as along the progressing cold front. What was most impressive was the extent of the detail which was provided by the GOES-16 Geostationary Lightning Mapper (GLM) imaging platform. What was most impressive was the fact that during the 120-minute footage clip of the GLM in action, there were even some moments where there appeared to be semi-symmetric lightning bursts in the center of the core circulation. This is a phenomenon which is often found in association with near-perfectly symmetric and very intense (and often mature) tropical cyclones. This finding proved that even though this extra-tropical cyclone developed rapidly just offshore from the U.S. East Coast, it did attain radar-based structure in the context of its precipitation which somewhat resembled a hybrid hurricane. This is a finding which is most common to be seen in association with rapidly intensifying low-pressure systems (i.e., in non-tropical situations) since when extra-tropical cyclones rapidly intensify, they can often take on characteristic appearances resembling low-end intensity tropical cyclones from a precipitation-based standpoint as far as regional Doppler radar observations are concerned. This structural resemblance occurs as a result of such rapidly intensifying systems quickly wrapping up and becoming more tightly-wrapped and more powerful low-pressure systems. Thus, this case and point just goes to show that the atmosphere can produce quite impressive displays when the right conditions and circumstances are in place. To learn more about other interesting weather observation topics from around the world, click here! A rainbow is an atmospheric optical phenomenon that can be seen in the sky right after it rains, when the Sun is shining behind the viewer and there are no clouds blocking the view. Within a rainbow, sunlight is separated into a spectrum of colors that appear to the naked eye after colliding with water droplets within the air. This is why rain is necessary in order to see a rainbow, and the viewer must be in the perfect position in order to spot it. Because the air is less dense than water, when sunlight passes through a water molecule, the sunlight travels slower through water than through air. This causes the light to refract or bend as it slowly passes through the water droplet. As light passes through the water droplet and refracts, it bounces off the inside of the water droplet before exiting the droplet in the same direction in which it first entered. When the sunlight reflects within the water droplet, the light separates into wavelengths, or colors. Thus when this light exits the water droplet it exits in this new spectrum of colors, displaying a rainbow. When viewing a rainbow, the colors vary from violet to red. Because violet is the shortest wavelength of visible light, it will appear to bend the most as light exits the water droplet, and therefore can be seen at the bottom of the rainbow. Red is the longest wavelength on the visible light spectrum and bends the least out of all of the colors, and therefore can be seen at the top of the rainbow. The brightness of these colors displayed within a rainbow depend on the size of the water droplets in which the sunlight is refracted. Water droplets with diameters over a few millimeters create bright and vivid colors, while smaller water droplets with diameters less than .01 millimeters create very faint rainbows in which the colors appear almost white and blend together. Rainbows are most common in the summer and are quite rare during the winter because in order to observe a rainbow in the sky there must be both sunshine and rain, therefore water droplets in the air. This is a common occurrence during the summer months. During the winter months, water droplets within clouds are often frozen ice particles that are incapable of scattering sunlight in order to create a rainbow. These frozen ice particles however can sometimes scatter and reflect light into very unique patterns. Double rainbows are a phenomena that may also appear if sunlight is reflected two times within the water droplet before exiting the particle. This secondary rainbow will appear to have the spectrum of colors reversed, with the red wavelength observed on the bottom, and the violet wavelength observed on the top. All rainbows are created through Geometric Optics, by this reflection and refraction of sunlight within a water droplet. To learn more about other interesting weather observations, be sure to click here! DISCUSSION: On Tuesday, February 12, 2019, the GOES-17 (Geostationary Operational Environmental Satellite) has been declared functional as GOES-West. GOES-17 has taken over the position of GOES-West at 137.2° W for GOES-15 which has shifted to 128° W. GOES-West handles the duties of taking visible and infrared imagery for the Western Hemisphere and the Continental United States. 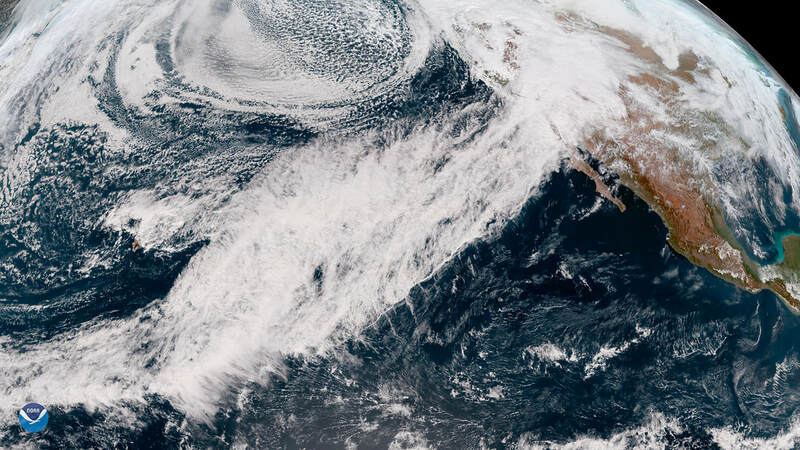 The first system captured by the GOES-17 as the new GOES-West was the atmospheric river event that was forecasted to hit the San Francisco Bay Area on the night of February 12. GOES-17, however, had some problems after being launched from Cape Canaveral on March 1, 2018. The main source of the issues that arose deal with the cooling and heating systems of the satellite. The cooling and heating of the satellite is vital as the infrared sensors detect radiation mostly in the form of heat from the Earth. The problem with a very warm satellite would make it harder for the infrared sensors to make significant distinctions between temperatures such as between a very cold ground with clear skies and a cloud top. The next satellite in the GOES series to be launched will be GOES-T. GOES-T is scheduled to be launched sometime in June 2020. The GOES-T is scheduled to be used as a storage in orbit just in case one of the other GOES satellites have to go offline or if there is a major malfunction. The GOES-R series, which includes the GOES-17 and GOES-T, is different than the previous GOES satellites as they have more advanced technology including for solar imaging than the GOES-13 series which is the GOES-13, GOES-14, and GOES-15. To learn more about other weather observation topics from around the world, be sure to click here! 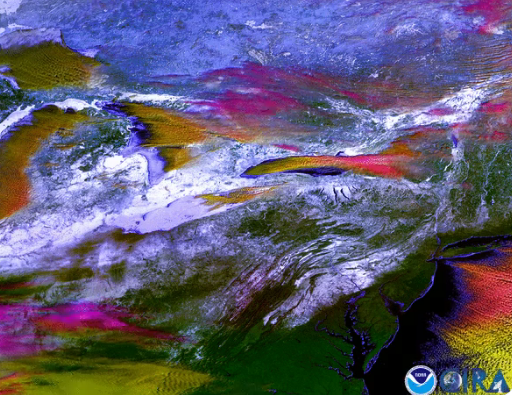 A Neat Cloud Phase Analysis Perspective of the Recent Polar Vortex-Induced Lake Effect Snow! DISCUSSION: As of the past week, millions of people spread across North America either watched in amazement or experienced first-hand what it truly means to encounter the full-force of the mid/upper-atmospheric Polar Vortex circulation. The Polar Vortex circulation is a periodically oscillation Arctic-based circulation which compromises a good portion of the coldest air which exists on planet Earth. Moreover, the Polar Vortex can sometimes split into separate components which are often referred to as “lobes” which can occasionally descend into the mid-latitudes (e.g., parts of North America and/or Europe) and consequently usher in severely cold air which can create dangerous or even life-threatening cold conditions for several days at a time when such an event occurs. As a result of this cold air moving through portions of the north-central and northeastern United States, this severe cold air intrusion ultimately triggered a major lake effect snow event downwind of both Lake Erie and Lake Ontario. Along with the fact that the respective lake effect snow events were very impressive, they were even more interesting to observe via GOES-16 satellite imagery. Attached above is a neat satellite imagery loop which was recently captured by the GOES-16 satellite imagery shows a neat perspective regarding how various types of clouds can be differentiated based on their respective phase. As you can see in the satellite imagery attached above, the white-colored regions indicated regions of snow cover on the ground, the yellow-colored regions indicate the presence of liquid water clouds, pink-colored regions indicate the presence of ice-based clouds, and green-colored regions indicate the presence of snow-free ground (i.e., just the typical clear surface of the Earth with a great view of the natural regional topography). This recent GOES-16 satellite imagery just goes to show that this state-of-the-art perspective of winter weather events can show how the cloud types moving across Lake Erie and Lake Ontario shifted from water-based clouds to ice-based clouds in accordance with the development of the corresponding lake effect snow bands. Thus, this goes to show how and why these lake effect snow bands impacted areas in and around Buffalo, New York as well as the Tug Hill Plateau region just to the east of Lake Ontario. 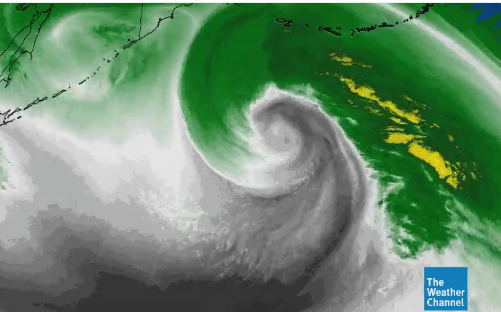 Respecting the Power and Beauty of a Powerhouse North Pacific Low-Pressure System. DISCUSSION: When it comes to the global observation of extratropical cyclone formation and evolution thereof, there is no question that cyclone structure can be one of the more interesting marvels of modern atmospheric science dynamical observations. During the heart of a given Northern Hemispheric Winter season, there can often be situations wherein low, mid, and upper level atmospheric support comes into place for the successful development of more intense extratropical cyclones. One of the premiere factors involved with the development of such intense Pacific low-pressure systems has to do with the presence of upper-level features most commonly referred to as an upper-level trough. An upper-level trough is an atmospheric feature which helps to amplify the degree of mid- and/or upper-level instability by way of increasing the mid- to upper-level temperature contrast. A mid- to upper-level temperature contrast is the primary catalyst which leads to a mid- to upper-level pressure contrast which leads to a more dynamically unstable mid- to upper-level atmospheric environment. As a result of these changes which sometimes occur at times over larger oceanic basins such as the Pacific and the Atlantic Ocean basins, there can also sometimes be the development of larger-scale low-pressure systems. When such low-pressure systems develop, you can sometimes observe more rapid development of such systems as is captured in the satellite imagery gif which is attached above (courtesy of The Weather Channel). In this water vapor satellite imagery gif attached above (courtesy of the Himawari-8 satellite imager), you can clearly see how rapidly such systems can develop when all the necessary factors come into place. From going to the adolescent phase of this system to the mature phase of this extratropical cyclone, you can see how quickly the structure of a developing oceanic cyclone can change. Moreover, you can also see how quickly the well-defined center of this low-pressure system formed and the corresponding convection which wrapped right around the immediate center of this system’s circulation. Currently, this system has deepened (i.e., has further intensified) all the way down to an estimated 937 mb low. Thus, there is no debate that this is a very powerful low-pressure system to say the least. It goes without saying that it is incredible to observe the gradual as well as real-time development of such low-pressure systems as they are truly a perfect case and point for how the atmosphere can sometimes perform at an incredibly high level. To learn more about other neat weather observation topics from around the world, click here! DISCUSSION: Earth's atmosphere can be divided into four layers based on how temperature changes with height. In the lowest layer of the atmosphere (troposphere), temperature generally decreases with height. Above that is the stratosphere where temperature increases with height. Then above the stratosphere is the mesosphere and thermosphere where temperature decreases and increases with height, respectively. In order for clouds to form, there must be water vapor in the air. Since the source of water vapor is the surface, most of the water in the atmosphere and associated clouds occur in the troposphere. However, on rare occasions, the small amounts of vapor in higher layers of the atmosphere can lead to cloud development. In particular, noctilucent clouds are thin clouds that occur in the mesosphere (~50 miles above the ground). When these clouds form, they tend to occur near the poles where the extremely low temperatures help them to develop. In addition, these clouds are extremely thin due to the extremely low amounts of vapor in the mesosphere. Hence, they can't be seen when the sun is high in the sky. Instead they are illuminated when the sun is low in the sky or below the horizon, which occurs a lot in polar regions. 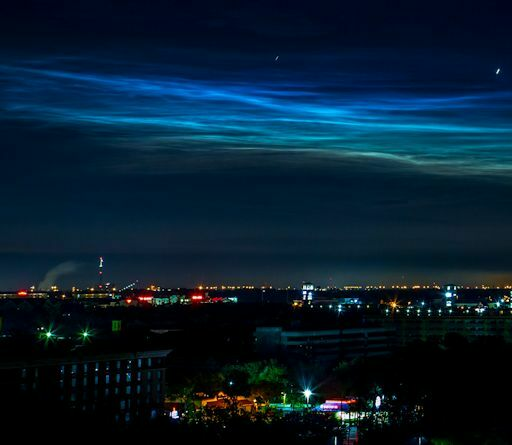 While noctilucent clouds almost exclusively appear in polar regions, certain conditions may allow them to form at lower latitudes. For example, the picture above shows a noctilucent cloud near San Francisco, CA. In this case, as a meteor burned up high in Earth's atmosphere, it created the right conditions for a noctilucent cloud to form at an unusually low latitude. Rocket launches can also help to generate these clouds in places where you wouldn't normally expect them to form. 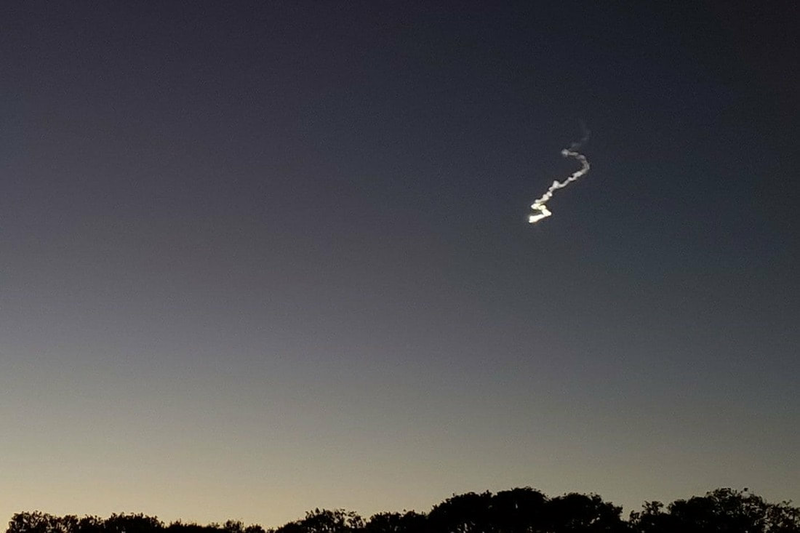 The picture below from spaceweather.com shows such a noctilucent cloud formation over Orlando, FL as a result of a rocket launch from Cape Canaveral. DISCUSSION: November 13th, 2018 became an important date for the remote sensing community. The National Oceanic and Atmospheric Administration (NOAA) launched Geostationary Operational Environmental Satellite (GOES) 17 on March 1st, 2018, November 13th marked the date that GOES-17 reached its final orbit. It is expected that GOES-17 will be the operational GOES West satellite beginning December 10th, 2018. This exciting occasion is expected to mark a time where high-definition images will now be relayed to earth of the Pacific region. Previous satellites marked heavy limitations on coverage for OCONUS (Outside Continental United States Overseas-often Alaska, Hawaii and U.S. territories), wherein GOES-17 comes to play. GOES-17 will provide a notable improvement in the ability for meteorologists to forecast weather. The satellite offers similar remote sensing tools to that of GOES-16, considered the eastern position of satellite orbit for the Americas. The ABI or Advanced Baseline Imager is expected to, “offer the same high-resolution visible and infrared imagery in GeoColor and 16 different channels, allowing us to track and monitor cloud formation, atmospheric motion, convection, land surface temperatures, fire and smoke, volcanic ash, sea ice and more, according to NESDIS (National Environmental Satellite, Data and Information Service). Previously, lower resolution images of Hawaii, and Alaska were being transmitted providing little clarity for forecasters. GOES-17 will contribute a critical mend to the issue of resolution, providing clearer imagery of our OCONUS states. The importance in this is the difference in atmospheric and environmental conditions in those locations that prove to be difficult to analyze. 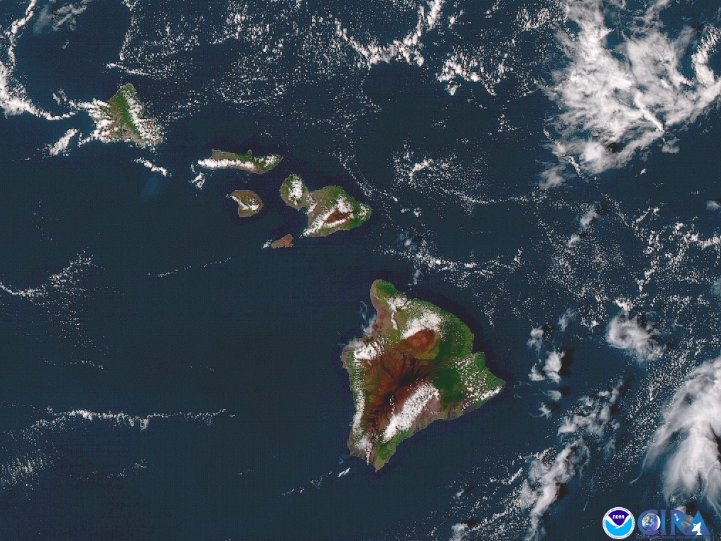 Hawaii being home to 11 of 13 climate zones, volcanoes, and its sheer location in the Pacific, makes understanding the Hawaiian environment a difficult one for atmospheric scientists. Alaska posing some similar forecasting issues with volcanoes (ash), sunlight, sea ice extent, a variety of conditions that GOES-17 is hoping to resolve especially given its capabilities regarding monitoring volcanic ash, sea ice and land surface temperatures. These high-resolution images will allow forecasters to properly determine orographic issues that may not have been previously seen on imagery. Current images being transmitted from GOES-17 are considered non-operational. December 10th, 2018 will mark the date for GOES-17 operational use, another landmark date for atmospheric scientists as data can be officially transmitted for practical use. For more information on remote-sensing products visit the Global Weather and Climate Center! “NESDIS News & Articles.” NESDIS NOAA, 15 Nov. 2018, www.nesdis.noaa.gov/content/noaa-goes-17-shares-first-images-alaska-hawaii-and-pacific. 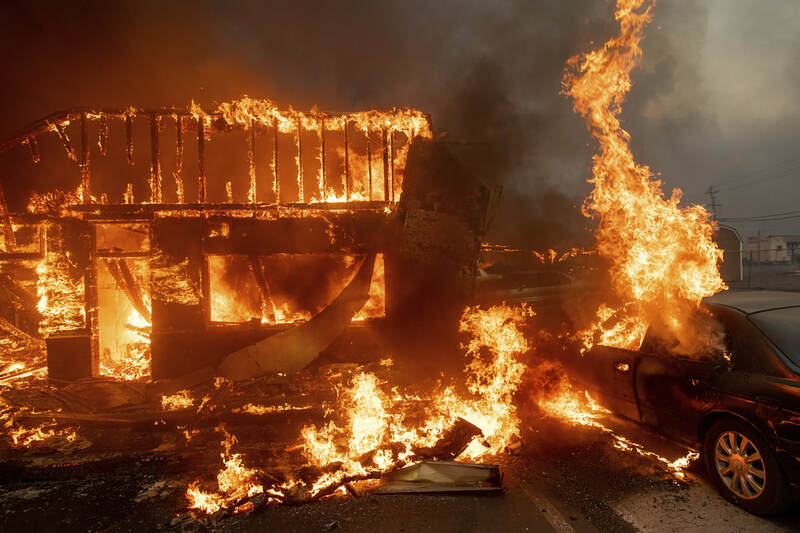 DISCUSSION: There is no debate whatsoever that the past 48 to 72 hours or so have been some of the worst for the state of California in recorded history in the context of state-wide wildfire impacts. Having said that, there are some impressive images and things can still be taken away from this absolutely horrifying and down-right terrible situation across various parts of both northern, central, and even southern California. Attached above is a brief video briefing which helps to capture and discuss a few of these points for everyone's insights and knowledge base. To learn more about this fire weather situation as it evolves, be sure to monitor our Twitter account as well as our website for updates! DISCUSSION: There is no doubt that #Florence has been firing up to no end on social media over the past several days, but there is more to this story "than meets the eye." What many people will often not consider when it comes to a given tropical cyclone landfall are some of the neater things which an individual can learn by simply observing air stream flow in the vicinity of a National Weather Service radar site. 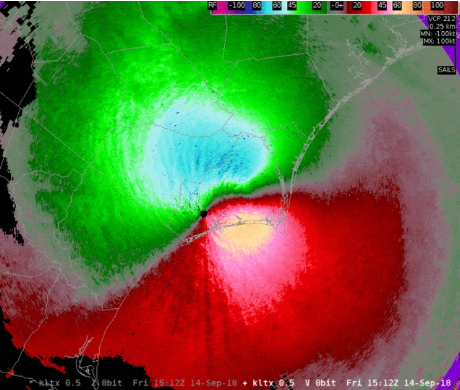 One such detail is how a dual-polarization radar system can identify key features associated with the approach and forward movement of a landfalling tropical cyclone. Attached above is a classic example in which a very clear and concise video briefing goes over one such topic to provide clearer insights into how Hurricane Florence could be seen and tracked via radar imagery as it slowly began to make its way across the state of North Carolina. To learn more about other neat topics pertaining to global weather observations, be sure to click here! DISCUSSION: With the GOES-16 (or also known as the GOES-East) satellite imager fast-approaching the 2-year mark of its existence as an orbiting highly-advanced weather and observational satellite imager, it certainly has already earned plenty of tremendous of respect and appreciation. Here, you will be taken through some of what this state-of-the-art satellite imager has already accomplished in a relatively short period of time since its launch in late November of 2016. It goes without saying that since the onset of the advanced remote sensing era, there has been a substantial increase in both the prevalence and the confidence invested into the integration of high-resolution satellite imagery into the both weather research and weather forecast process. As operational National Weather Service meteorologists and other atmospheric research scientists continue to adapt to revolutionary changes in the ways by which we are now able to study the atmosphere, so will the level of detail we find in corresponding results of such work. Thus, it goes without saying that the impacts of the GOES-16 satellite imager have transformed weather forecasting and applied research in a number of profound ways. For example, before the introduction of GOES-16, we could never visualize the initiation of severe thunderstorms to the level of detail which we now can. Whether it is understanding the rate of change with time in terms of how fast the updraft columns are growing horizontally and vertically within a strengthening convective storm or understanding how fast the cloud-top temperatures are evolving on a minute-to-minute basis, GOES-16 is forever changing atmospheric science. Moreover, when it has come to forecasting both short-term and longer-term changes in association with Tropical Atlantic and Tropical Eastern Pacific hurricanes, GOES-16 has allowed atmospheric scientists who study tropical cyclones in sparkling details and learn even more than we already know and understand about the dynamics and inner core structure associated with both developing and mature tropical cyclones. Whether it has been getting a close-up view of eye wall formation, eye wall replacement cycles, deep convective generation within the inner core of more intense hurricanes (e.g., Hurricane Harvey, Hurricane Irma, and Hurricane Maria from 2017), or even having a more clear understanding for how various tropical storms have interacted with islands or coastal as well as more inland regions of the United States, GOES-16 has not failed to disappoint. Another example of this phenomenal ability is shown in the animated visible satellite imagery of Hurricane Aletta attached above (courtesy of Meteorologist Dan Lindsey who is currently a Senior Scientific Adviser from the National Oceanic and Atmospheric Administration's National Environmental Satellite, Data, and Information Service program). 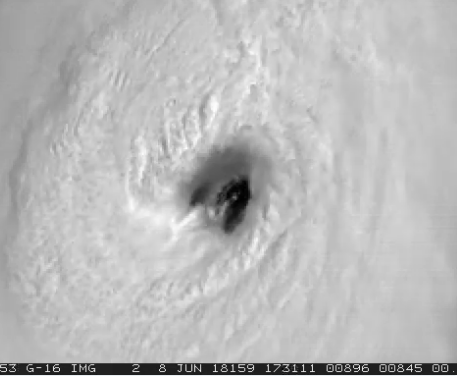 It is worth noting that Hurricane Aletta was one of the first tropical cyclones which was captured in real-time by GOES-16 and the level of detail you can see within the inner core of Aletta in this animated satellite imagery effectively speaks for itself. In other respects, GOES-16 has also helped meteorologists to better understand how various atmospheric phenomena work even more which include (but are certainly not limited to) sea-breezes (and convection thereof), cold front progression, squall line formation and/or evolution, fog formation and/or dissipation, wildfire forecasting (and critical monitoring thereof), etc. Thus, these are just more examples which help to strengthen the net argument for how the GOES-16 satellite imager is forever changing the ways in which we are now able to look at and study the Earth's atmosphere and all the remarkable forces of nature which it generates year in and year out. To learn more about other neat meteorological observational stories from around the world, be sure to click here!